My childhood memories are very distinct. I remember the smell of old library books, making blanket forts, and weekend trips to Chinatown in Toronto. I grew up in a small town in southern Ontario, near Blue Mountain. I was the only non-white person in my class, and one of the handful of ethnic kids in my entire town. There weren’t large grocery stores that sold the Asian fare that my parents were accustomed to in Vietnam, so we’d make the two hour drive to Toronto at least once a month to buy our coveted delicacies of home. I buried my nose in tales of The Babysitter’s Little Sister Club books, skipping over that long-winded chapter where Karen describes what it’s like to have divorced parents. Then came the juicier chapters in which Karen inevitably overreacted at something and inevitably had to come to grips that she needed to express her emotions in healthier ways. I would snack on the huge tupperware of fruit my mom always brought. Cantaloupe, honeydew melon, watermelon… with a fork for all three of us. My dad would play one of his awful cassette tapes of Vietnamese music, where some crooner would wallow about lost love, how he missed his mother, or how the war tore Vietnam apart. When I was seven years old, my parents gave me a CD player that I coveted, and I would drown out those long trips of unbearable music with CDs of Britney Spears and Backstreet Boys over and over until it ran out of batteries and I had to beg to get more. When we finally arrived at the supermarket, it was an enclosed plaza in the north end of Toronto at Black Creek and Lawrence. It’s still there today—The Lawrence Supermarket. Our trip would start off with a visit to the pho restaurant. A draft of spiced, brothy air would wash over us as we entered the restaurant. My mom would pour the tea, and my job was to clean and set out the utensils: one spoon and a pair of melamine chopsticks for each of us. When bowls of steaming pho would come, we’d all sit in general silence, slurping at our noodles and listening to the conversations around us. Sometimes, if I was lucky, I would get an my avocado smoothie for dessert. I sat there with my giant smoothie in my little hands, supervising my mom’s purse as she went to the bathroom and while my dad went up to pay. My mom would glide back with her easy grace, scoop up her purse, and whisk me away to the supermarket. I would walk the aisles, surrounded by fruits and vegetables I would only see in Vietnam and in plastic, coloured colanders at family gatherings. I would poke at the huge bins of live crab, ogle the tanks of fish swimming and trying not to make eye contact with the clouded eyes of gutted fish on ice. Just remembering this makes me so happy I’m vegan because I never will have to clean or debone a fish. Once I got separated from my parents and instead of breaking down and crying, helpless, I walked up and down the aisles in hopes of finding my mom. Lost and determined to find her, I came up to a cashier, my nose barely above the conveyor belt, telling her my mom’s name and that I couldn’t find her. She looked at me, a little dumbfounded, then heralded my mother’s name over the speaker. Minutes later my mom came rushing to the cash to find me. It was a blur what happened after, but trips from Toronto always ended with a bag full of individually wrapped banh mi. 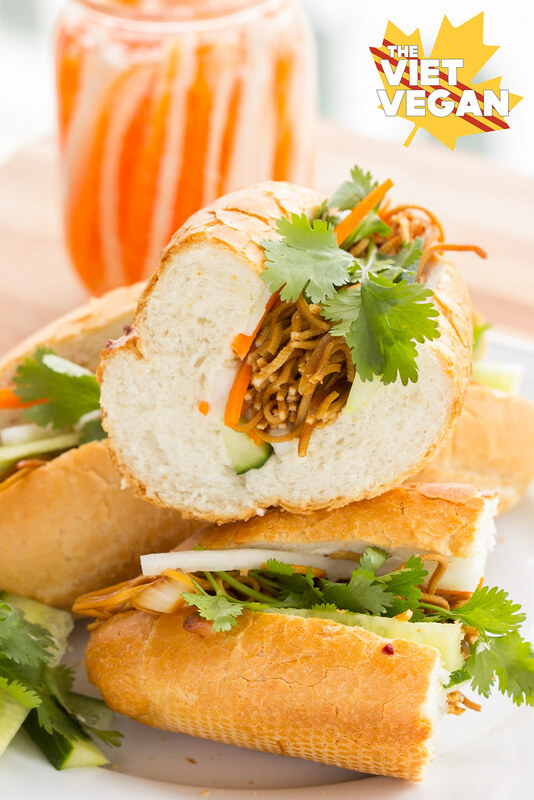 Wonderfully crisp and airy baguettes, filled with picked carrots and daikon, cucumber, butter, mayo, pate, and cold cuts. The drive home was always me surrounded with a halo of Pocky, lychee jellies, tamarind candies and my banh mi, listening to Britney Spears, “Lucky“, muffling out the sound of my mother scolding me for leaving crumbs all over the back seat. To make the tofu filling, in a skillet over medium heat, cook onion and olive oil until onions are softened and cooked through. 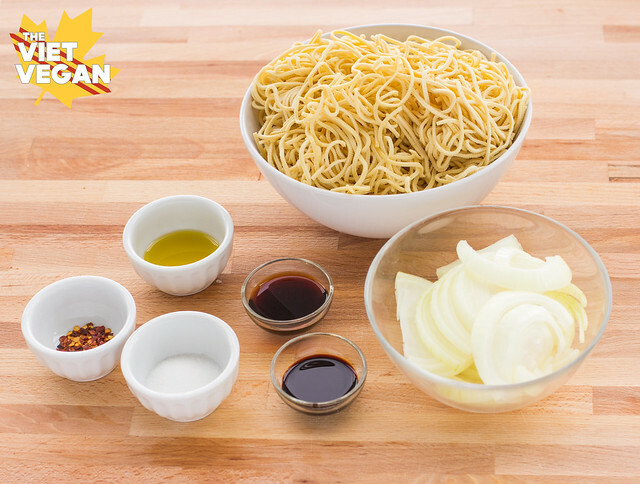 In a small bowl, whisk to combine red chili flakes, sugar, dark soy sauce, and regular soy sauce. Add bean curd strips or cut tofu, and pour soy sauce mixture overtop. Stir to coat, cooking until tofu is softened and liquid is absorbed. Remove from heat and set aside. Toast baguettes until golden and crispy. Spread mayo on the inner top half of baguettes and butter on the bottom half. Add do chua, cucumber slices, and tofu filling. garnish with cilantro, and serve immediately! Thanks Cadry! It's funny how something so regular can strike such a distinct memory. Haha I loved your story of running around Toronto. 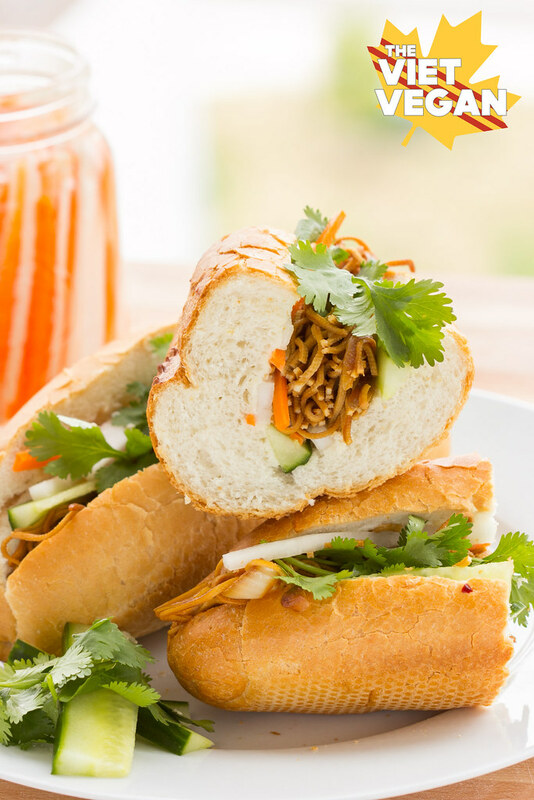 I confess I've never had Banh Mi before, but I do know about it. It looks out of this world delicious, Lisa!!Yum! Hahah thanks Katie! Actually it's hardly in Toronto, it's on the very north end of it. Just think of all the delicious vegan noms I can take you to downtown if you ever come visit!! 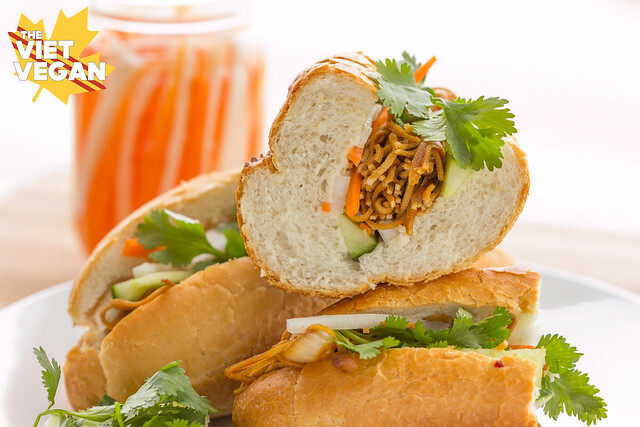 What do you have stuffed in your Banh mi? It looks like noodles. Is it perhaps the tofu curd cut in thin strips? thanks. Have you tried Mama's Tofu? I think it is in the plaza you mentioned at Lawrence and Black Creek. Amazing vegan pho!! !